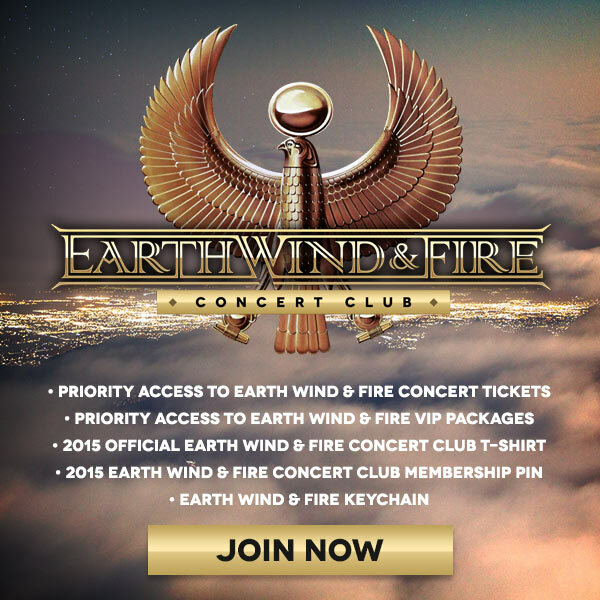 Join the All New EWF Concert Club for EARLY PRIORITY access to our Concert Tickets and VIP Packages! This may be my last chance before I die! MY WIFE AND I JUST JOINED CONCERT CLUB THRU TICKETMASTER. HOW DO I GET MY TEE SHIRT AND KEY CHAIN? When are you coming to Orlando, FL I see no tour dates for Florida period. I’ve been a big an of earth,wind and fire since the early 70’s. This group brings a lot of everything to the table,with maruice white, the soul founder of the group,ewf, hit after hit, now there older and still have ticket sell out crowds. Excited to bring my wife to see you perform at The Forum on July 18! The last we saw you was in Irvine CA in 2006. My wife was pregnant with our first son at the time and she could feel him kicking to the beat of your music! Your music has also influenced me to play the saxophone. After all these years, I’m finally making a record with Grammy winning producer, Paul Brown. My first concert was in Stockholm together with you in 1981, since then I have listened to you at least 3-4 days per week. You are an amazing band with a good message and feel. A few years ago I noticed my despair during the holidays that you would play where I live. Booked my fligt to see you live but unfortunately the plane was delayed so missed the concert :-(. Now, I hope you guys can come to Europe in the near future. You have been a part of the family and through baptism, funerals with your music. A devoted fan who really miss you guys, please com to Europe! Does anyone know the music set for the opening Heart and Soul EWF/Chicago concert in Concord, Ca last night? At the show in Nashville,TN with Chicago you all are still bad boys Aug 1,2015 show wow!! It was a great pleasure and highlight to take in the EWF/Chicago show last night in Indianapolis. Not only was the show great but the fellowship of all people there was sublime. It was all good, but a shout out to the Presence and showmanship/leadership of Verdine White! And Phillip Bailly, my wife was not expecting you to have the voice you had in 1986!!! Wow. Thanks guys in was a singular highlight of my life to take you in… (my 18 year old Jazz/Rock loving son’s suggestion to book the tickets, and we might take in another show!!! Thank you!!!! Are you coming to Washington State this year?? I have been checking The Earth Wind and Fire website & Ticketmaster. I have not seen a date for Washington State. I hope you have a show here. It is such a great performance. I really wanted to hear the famous upbeat songs just like the records. This is why cover bands are popular because they play the songs just like the radio. Also it was too loud and difficult to hear all the instruments. I am sorry it was good but not what I thought I was going to see. Springfield Missouri. earth wind and fire you are truly the best band in the business today,and it will be a long time before we(the people) have the rare and exisite pleasure of the talent,good spiritual temperament and optimism that earth wind and fire brings to the heart and souls of all kinds of people worldwide.you have truly entertained me and there are so many memoriers that you have created throughout my life,with someone who was very special to me .earth wind and fire you were there with me all the time,and when you took a break musicly and i said one day wheres earth wind and fire? you came back with” touch the world”.and I knew then that you are a special gift to us from God almighty.may his blessings continue on you and to us through you! I was so disappointed I couldnt get tickets, bournemouth when will you be back to uk I’ve got to see you at least once in my life I just love you and music it just gets in your soul and brings life and happiness to my heart…kiss diana you touch so many hearts. You have always been one of my favorite bands. Saw you guys at Wannee, you should have been the headliner. Everyone loved you. Can’t wait for St. Augustine! Each time I listen to EWF , I am so moved by the music. Philip, your voice is a gift from God. Verdine, your energy is pure excitement. Ralph, you support is awesome. David, your smile is magic. Serg, talent beyond time, Myron, magical fingers, Gary, sound beyond belief, Bobbie and Reggie, you guys are awesome, John, effortless energy and Philip Jr, you are the luckiest guy on earth. I really hope you come back to Detroit/Toledo this summer. I saw you guys at the Toledo Zoo Amphitheater, second row front. Thank You for sharing your awesome talents with the rest of us. Please tell me the guys will be making an appearance in Colorado this year! fantasy. in a few hours i’ll celebrate my 43rd birthday. while ewf has been ever-present in the soundtrack of my life, fantasy is easily one of the best and most important gifts i’ve ever received. everything about this song struck something very necessary in my soul as a child and over the years to adulthood. i can only try to define it as something to do with my thoughts of myself and the world… almost like it validated that i live, i feel, i belong. i’m part of something beautifully powerful, divinely special and supremely bigger than any one thing i could think of. but not only me. we all do. that message was so perfectly timed, performed and received. i love this song and what it added to my concept of myself and others since i first heard it while lookin out the window from the backseat of my father’s thunderbird as he drove down crenshaw listening to kjlh. that concept helped put and keep a peace in my soul that has served me very well over the years. for this, this birthday girl appreciates ewf. thank you! just like “every man has a place…” ewf will always have a place in my heart. You are a good group to listen to .Are you to make a new album? I celebrated a very important birthday milestone with one of my daughters in Tennessee last year on March 15th 2017 at your concert. It was the best birthday ever, getting to meet and take pictures with you backstage. When I realized the concert was on my birthday, there was no way I was going to miss it. I took a half day off and we drove up from the Atl, changed at hotel and headed to the venue. It was an awesome experience for both myself and my daughter, who to my surprise danced more than I did. Then again, she grew up on your music. I truly enjoyed my birth night and hope to have the same experience with my younger daughter one day. Ps: my eight year old granddaughter’s favorite EWF song is ‘September’. I was an Earth, Wind & Fire fan a long time ago when Verdine played that Telecaster bass. Since then I ve seen them in concert 41 times and own on CDs every thing from the first EWF to Now ,Then & Forever, I rule! It is really unfortunate that so many people miss out on the best EWF music by not playing the entire album. Songs that were not “hits” ,but wonderful music ie,Love is life,Where have all the flowers gone? ,Mom,Zanzibar,See the light,Caribou,New world symphony,Faces,You went away,Turn it into something good,Touch the world,Miracles,Sweet sassy lady,Superhero, Chicago song,Round and round,Where do we go from here? ,Suppose you like me,Love is law, Guiding lights,Splashes and The Rush. My advice to any EWF fan, PLAY THE ENTIRE CDs or ALBUMS ! Fantastic show put on once again by the Elements at the Mn State Fair 8/26/18! Thank you gentlemen! Long live the FIRE!! When will the group be coming back to San Antonio, Texas! My older brother intoduced me to EWF when I was a child. Over 30 years later, I still consider myself your #1 fan. I attend your concerts whenever you are in my area. The talent and professionalism is unmatched. All these years, EWF has been dedicated pand committed to providing elite performances. I ALWAYS know what I am getting when I attend an EWF concert. I look forward to seeing my favorite band again soon.